One of our projects was to redecorate a home just off of Primrose Hill in North London. It’s a very up-market prestigious area with some very expensive homes. Famous people living in this area are; Kate Moss, Jude Law and Jamie Oliver! Working in conjunction with the architect, interior designer, builder and client GS Decorating were tasked with redecorating a newly created basement flat, a four storey high twisting staircase, bedrooms and lounge to a high end specification. The current state of the property was on a decent nature however with a young family the owners were now looking to modernise the look and feel of the home while keeping things understated and homely. 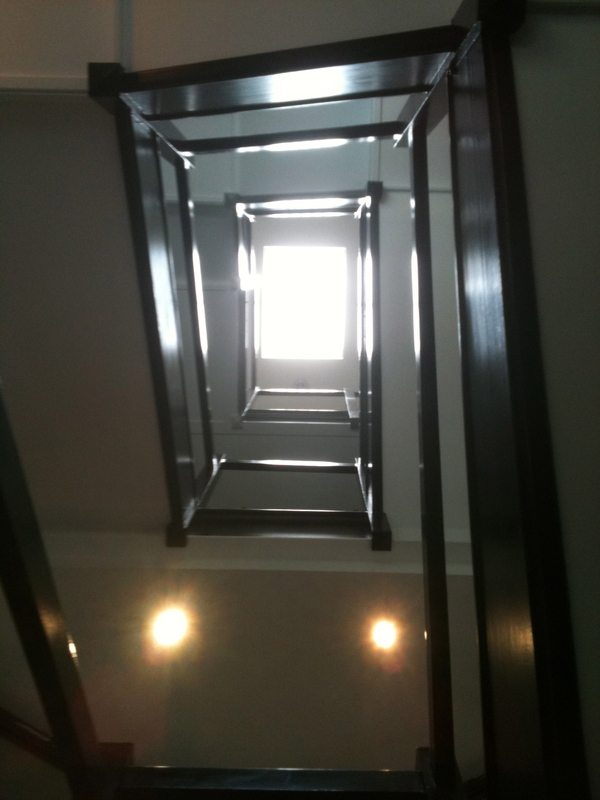 Being a four storey town house meant that the stairwell is the centre of the home and sees high traffic throughout the day. The interior designer had planned a contemporary feel mixing light and dark to create space. This involved painting the current white wooden banisters to a matt black finish. As professional painters and decorators in central london GS Decorating first concern was the ware and tear this area would potentially receive due to a young family and frequent visitors. After priming and undercoating the wood we coated up using Little Greene oil based egg shell which is a traditional paint that leaves a great flat matt finish and is strong enough to withstand the use of a modern family. At the top of the staircase a black feature wall was specified. Here we used Farrow and Ball ‘pitch black’ from their modern emulsion range. However, during the project this wall was marking very easily with other trades often brushing past and scuffing our work, which as very annoying! In general, Farrow and Ball is an easily marked paint, however to give it some extra protection we coated over the wall in two coats of clear matt finish varnish which helped to seal the wall for wandering hand marks and knocks. Our team of central London decorators are all highly skill and trained painters and decorators who specialise in high-end residential and commercial projects. Whether you are looking for a modern or traditional look in your home GS Decorating are available to offer the correct advise to help you with your decorating choice. If you are looking for highly skilled decorators in the Central London area please contact us now. Please fill in your details below leaving a means of contacting you and we will get in touch straight away.